Find out how our travel insurance can cover your holiday to Greece. When you’re ready, get a quote online or talk to our friendly team today. When you escape to Greece, you want ultimate relaxation. From cobalt seas strewn with islands to sailboats and sandy beaches, it’s a step into paradise. That is unless something goes wrong. To ensure your travels run smoothly, travel insurance should be your priority. Just so you’re covered in case the worst happens. After all, we’re sure you like to get things right. So do we. That’s one of the reasons why we’ve been voted the UK’s Most Trusted Travel Insurance Provider*. With a tailored policy, you’re protected if something goes wrong. In just a few minutes you can be covered for your travel plans and medical history. You can get your tailored quote for travelling to Greece online here, or pick up the phone and talk to us now on 0800 033 4902. 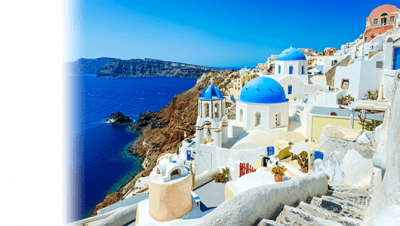 Why do I need travel insurance for Greece? We all want a holiday to be uninterrupted bliss, but sometimes the reality is less idyllic. Unfortunately, the worst happens more often than you might think. In 2017, 1 in 20 people had to make claims on their travel insurance**. So, when something does go wrong, it can save you a lot of grief if you have proper travel insurance to soften the blow. It could be a health emergency that interrupts your holiday. Maybe the need for medical transport home. Or delayed luggage, lost passports or money. For these and many other unwanted surprises, we can be on hand to help you and your family. It doesn’t cost much to do things the right way and to set your mind at ease. Both of which are our number one priority. What does our travel insurance to Greece cover? Should I take an EHIC to Greece? Yes. It’s a requirement of our travel insurance to take an EHIC with you. But remember an EHIC is a compliment to travel insurance, not a substitute for it. EHIC does not cover you for non-medical related mishaps on your trip, and won’t cover you if you need to be flown home by air ambulance. An EHIC entitles you to free or subsidised health care in the state health providers in Greece. If you use an EHIC, we will waive your travel insurance excess if you need to make a medical claim (this could amount to £100 per person on a Basic policy and £65 for Comprehensive policies). When getting a quote, you’ll need to complete a medical screening. This helps you to tailor your policy, both location-wise and medically. Covering any medical conditions you may have will help to avoid large medical bills if the worst happens when you’re away. It’s vital that you give us full and accurate answers. If you have a medical condition and you don’t let us know, it could mean that in the event of a claim you’re not actually covered. After all, it’s always best to be safe than sorry. We’ll simply ask you a few questions about your medical history. We use the same system for all our customers, and always treat information confidentially. If you have a medical condition but it’s not included in your policy, it would mean you are not actually covered if you have to make a claim. To help you during the process, it’s a good idea to have details of your medical condition to hand. But don’t worry, it takes minutes and is very easy to follow. You can go through the screening process online, or if you prefer you can do it over the phone with the help of one of our friendly team. You can get your tailored quote online now or call us on 0800 033 4902. What if my airline or travel company goes bust before or during my trip? You won’t be surprised to hear that this one of the main worries our customers mention to us. Unfortunately, in the past few years we’ve seen several travel companies and airlines collapse. It’s left thousands of holidaymakers with non-refundable holidays or stuck in airports with no flights, because their holiday arrangements were not covered by ABTA or ATOL Licences. I’ve already bought my policy. If I want to make late changes to it, will you let me? We’ll certainly try to. We know that things can crop up before you go (changes to your medical condition or need for additional areas of cover), please let us know by phone as soon as possible. We’ll do our best to see if we can increase your coverage where necessary. If something changes before you go away, it is essential that you let us know. Otherwise, you might not be able to claim on your insurance if the worst happens. Please remember that we can increase your policy coverage, but we can’t reduce coverage in return for a partial refund. So, do check that you’re happy with the level of cover when you book and that you’ve told us everything. You simply call the number on your policy, explain your situation to us, and so long as your policy covers your claim and you have the right documentation, we’ll get to work in sorting it out. Get your travel insurance for Greece today in minutes, while tailoring your quote to you and your family’s medical needs. Call us on 0800 033 4902 or get your quote online today.